(Last Updated : 22.11.18). Download Admit Card of UGC NET DEC 2018 Exam December 2018. NTA will conduct UGC NET DEC 2018 Exam between 18-22 December, 2018 as per the schedule for Junior Research Fellowship (JRF) & Assistant Professor Eligibility. NTA UGC NET Exam 2018 will be held for all two papers - Paper-I (General Paper), Paper-II (Subject related Paper). All the registered candidates of UGC NET DEC 2018 can download their admit card from the official website of NTA NET i.e. www.ntanet.nic.in as per the schedule given here. Download UGC NET December 2018 Admit Card, Exam Schedule, Exam Centre and instructions for the NTA UGC NET 2018 Exam. Candidates who are appearing in UGC NET Exam Decenber 2018 can download their admit card or Hall Ticket w.e.f. 19.11.2018 as per the schedule. Candidates are required to submit their Application Number or Registration No. and Date of Birth (DOB) details at the official website of NTA NET. Candidates can download UGC NET Admit Card as per the steps given below. Visit official website of NTA NET i.e. www.ntanet.nic.in. 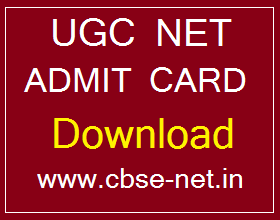 Click 'Download Admit Card for UGC NET Exam'. Submit your Application No. or Registration No. & D.O.B. details. Download Admit Card & print the same. Read the Instructions/Important Note for UGC NET Exam printed on the admit card and follow them in the examination hall. Name of the exam centre or Venue of Test will be printed on the Admit/Admission Card with date and timing of the test. Candidates are advised to check the name of exam centre properly and reach the exam centre as per the instructions given on the admit card. NTA will conduct UGC NET Exam DEC 2018 between 18-22 December, 2018 instead of 9-23 December, 2018 as per the schedule given below. The questions will be generic in nature, intending to assess the teaching/research aptitude of the candidate. It will primarily be designed to test reasoning ability, comprehension, divergent thinking and general awareness of the candidate. This will be based on the subject selected by the candidate. All the questions of Paper–II will be compulsory.